During February 2006, an excavation was conducted along the northern fringes of Khirbat Lubiya (Permit No. A-4727; map ref. NIG 24035–60/74289–90; OIG 19035–60/24289–90), prior to widening Highway 77. The excavation, undertaken on behalf of the Israel Antiquities Authority and underwritten by the National Road Safety Company, was directed by B. Hanna, with the assistance of A. Najar (area supervision), Y. Lavan (administration), A. Hajian (surveying and drafting), H. Smithline (photography) and H. Tahan (pottery drawing). Khirbat Lubiya lies on a forested hill, c. 1 km southeast of the Golany Junction. Three squares and four half-squares (125 sq m) were excavated. 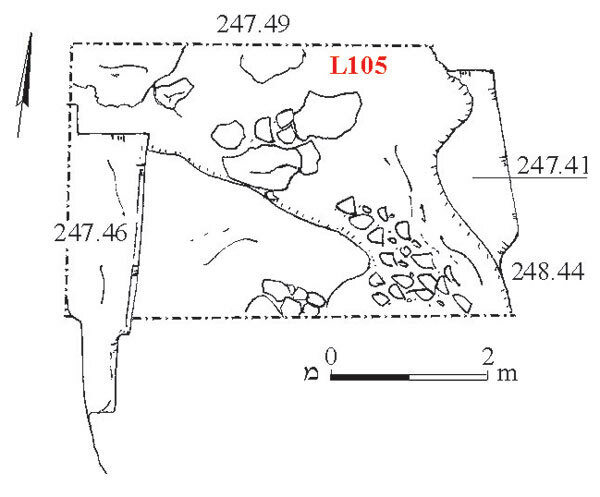 Remains of a quarry (Stratum III), a rock-hewn tomb and quarried pit (Stratum II) and remains of buildings that were part of the Lubiya village (Stratum I) were discovered. Lubiya had been located at this spot from the end of the Ottoman period until the founding of the state and was the largest settlement in the Tiberias district. A previous excavation at the site (Permit No. A-4405) revealed settlement remains that dated from the second century BCE until the fifth century CE. Stratum III. 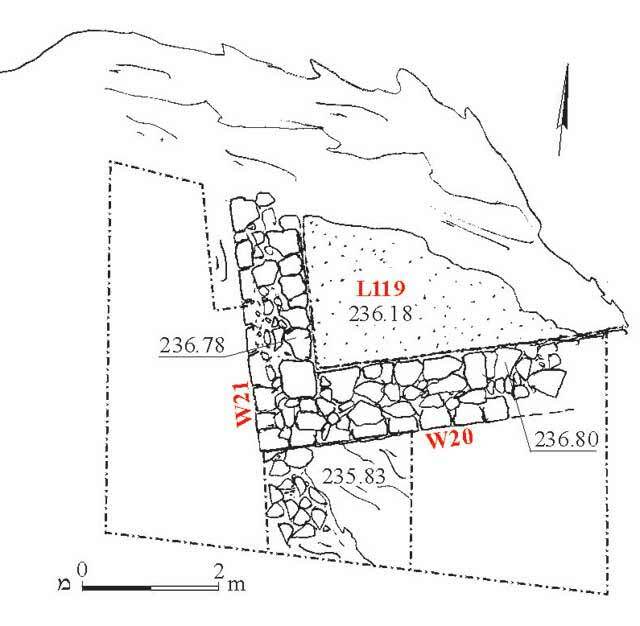 Hewn vertical bedrock walls were exposed throughout the entire excavation area, having different lengths and depths (Loci 104, 105, 107, 109, 113; length 1–3 m, depth 0.2–1.2 m; Figs. 1–4). Some of the rock-cuttings were barren and some were covered with alluvium, which contained a few potsherds from the Roman period, such as a jar (Fig. 5:1). These rock-cuttings were part of a quarry for masonry stones, which operated in the region. Stratum II (Fig. 4). A bedrock-hewn cist tomb that was aligned north–south (L106; 0.30–0.45 × 1.80 m, depth 0.5 m) was discovered in the vicinity of Rock-cuttings 107 and 109. A circular rock-hewn pit, which became wider toward the bottom (L115; upper diam. 0.73 m, lower diam. 0.85 m, depth 0.35 m), was exposed 3 m west of the tomb. The tomb and the pit were hewn in the area of the quarry and therefore postdated it. StratumI. Remains of a building, founded on the remains of the quarry, were exposed 13 m east of Rock-Cutting 104. The building comprised an eastern (L110) and western (L112; Fig. 6) rooms. The walls of the structure (width 0.65–0.75 m, preserved height 0.4–1.3 m) were built of dry construction utilizing roughly hewn, small and medium-sized soft limestone. The white plaster that coated the interior face of the walls was applied to a gray foundation layer of ash, lime and some straw; in several places two layers of plaster were discerned, the earlier one was dark blue and the later—white. The floor of the building was well-preserved and consisted of a thin layer of smoothed concrete set on a bedding of concrete mixed with small stones (thickness 7 cm). An opening (width 0.88 m) with a threshold of smoothed concrete was set in the wall that separated the two rooms (W11/W18). It seems that in the eastern wall (W15) of Room 110 was another opening that led to a room, which was not preserved. A square installation (L124; 1.90 × 1.95 m, depth 0.5 m) that was built of small and medium, roughly hewn limestone was discovered below the floor in the northwestern corner of Room 110. The interior surface of the installation was coated with white plaster. Travertine had accumulated above a layer of sand at the bottom of the installation and a channel (width 0.45 m) led to it from the west. It seems that the installation was used as a septic pit. A large quantity of ash, which probably stemmed from the burning of wooden roof beams, was discovered above the floor of Room 112, as well as various artifacts that dated to the end of the Ottoman period and included the top of an oven, a lock, a sickle, an iron rod used for locking the door and fragments of a decorated plate. A niche (0.30 × 0.65 m, height above floor 0.8 m) was installed in the eastern part of W10 in Room 112. Another niche (0.38 × 2.00 m, height above floor 0.65 m) was built in the room’s southern wall (W18); in a later phase the niche was made narrower by half a meter. An opening (width 1 m) that led to a courtyard was set in the middle of W17 in Room 112. A small section of a floor (L121; 1.0 × 3.5 m) that was set in a manner similar to the floor of the building was preserved in the courtyard. An installation (0.65 × 0.80 m) above the floor in the western corner of the courtyard was built of small and medium-sized limestone and preserved to a maximum of two courses high. A fragment of a ceramic bread seal was discovered in the upper part of the installation (Fig. 5:2). It is possible that the two rooms were part of a complex of rooms surrounding an inner courtyard. The corner of another building, founded on bedrock, was exposed c. 200 m west of the building remains (Fig. 7). The continuation of this building was destroyed when the road was paved. The walls (W20—width 0.75 m; W21—width 0.65 m) were built of an inner row of small and medium, roughly hewn limestone and an outer row of medium-sized, dressed hard limestone. The inner face of the walls was coated with white lime-based plaster. The walls were preserved 0.6 m high. 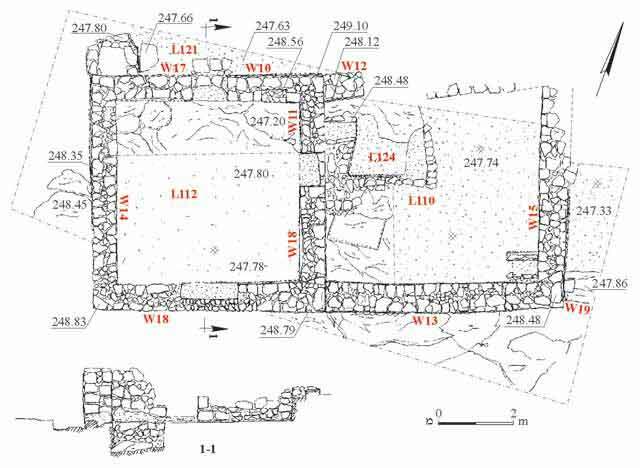 The concrete floor of the building (L119), which abutted Walls 20 and 21, was similar to the eastern building. 1. 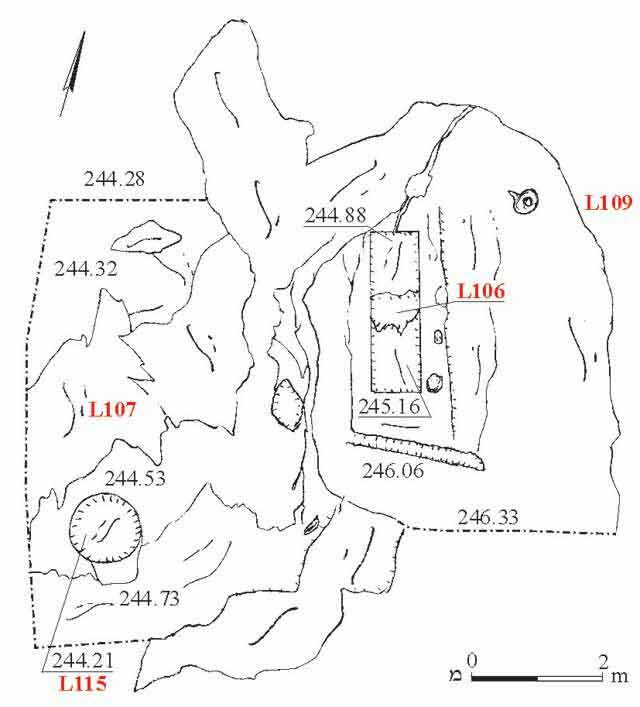 Rock-cutting in bedrock (L104), plan. 2. Rock-cutting in bedrock (L105), plan. 3. 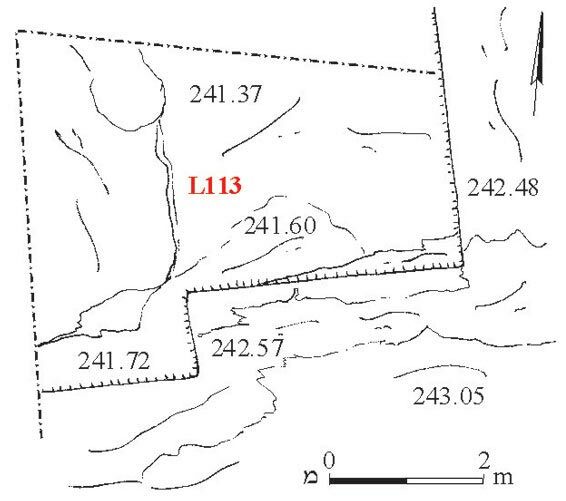 Rock-cutting in bedrock (L113), plan. 4. 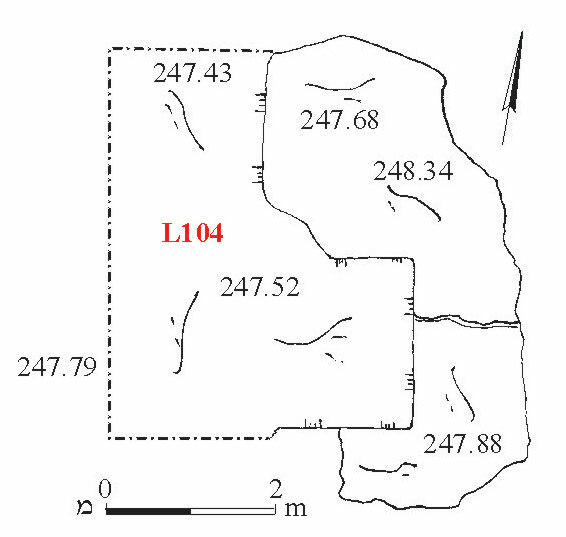 Rock-cutting in bedrock (Loci 107, 109), a tomb (L106) and a pit (L115), plan. 6. Building remains, plan and section. 7. Corner of a building, plan.